After a long absence from New World Notes, Gwyneth Llewelyn returns for a brilliant, 2500 word meditation on the state of celebrity-- in Second Life, and in the world outside. William Gibson may have trouble exploring SL on his own, but his influence on its culture is still pervasive. Because in her essay, Gwyneth cites Gibson's Idoru to argue that our very concept of real world celebrity is becoming more virtual; Second Life's version of fame is only the most extreme example of this process, but in the near future, it'll become mainstream. Find out how after the break. William Gibson’s Idoru (1996) is a cyberpunk novel set in 21st century Tokyo which explores an actual, contemporary Japanese phenomenon of girl bands that are completely synthetic, but still become popular cult figures. This is not an isolated example, for many actors who lend their voices to popular video games in Japan become celebrities in their own right (the MegaTokyo series of web comics, written and drawn by Fred Gallagher, explores this issue as well). Thus, at the beginning of the new millennium, many of us already take for granted that some of our celebrities are not flesh and blood, but mostly virtual — or, at the very least — digitally enhanced, as this nice YouTube video from Dove shows. Gibson plays with this notion a bit, by introducing an impossible marriage between a flesh-and-blood celebrity (a rock star) and an idoru, a "virtual idol". Actually, Gibson was probably predicting the future more accurately than he even thought. The gulf between our perception of what a celebrity is, and what she really is backstage, becomes wider and wider. The Simone movie basically addressed the same issue. When the costs of maintaining a real actor — who needs food and a salary, and is subject to moods, illness, and aging — become so huge, will we simply replace them with digital persona, without a physical counterpart? Ray Kurzweil, the guru of the extropian movement, created a virtual rock star as his alter ego, Ramona, to illustrate this point — Ramona performs on stage and attracts real audiences, but she does not physically exist. In Second Life, however, we have crossed that barrier already — people attend "live concerts" with virtual artists routinely. The artists become the focus of a fandom movement; they are interviewed by the media and blogged about; they make a living out of it. And, very likely, people fall in love with their SL-based idorus. I often retell a real story of a top executives' meeting of one of the leading European cosmetic companies, held a few years ago. They had a very difficult task ahead of them. One of their brands, introduced in the 1960s, had an aging model — but one who was literally the "face" of a line of hairsprays. When it was clear that no amount of surgery and cosmetics would make people believe in the model any more — she was 60ish at that time — they tried to replace her by introducing four new models and re-branding their hairspray. The marketing department hoped to see which one of the four would sell more, and hire the winning face to replace their old model. Surprisingly, sales on all four lines dropped substantially. The company panicked; clearly, their major source of income came from women who bought the hairspray in the 1960s and were still very faithful customers, because they identified themselves with that particular model — and no one could replace her. So, the executives met together again, and perhaps for the first time in history, seriously considered using a fully digitized version, instead. One that would not age — ever — and have an idealized, perfect beauty which would transcend the times. At the end of the meeting, they agreed that it was not time yet for that leap, since they still wanted to have the model appear in the flesh and give away hairsprays to her fans — even if that meant an extraordinary amount of cosmetics and special lighting for just a few minutes, to maintain the illusion. They retained the model and abandoned, for a while at least, the notion of going to a digital model instead. But the day will come when the poor model will, eventually, die. What will the company do next? Digital manipulation of images and movies go a long way, and they get better all the time. But things like the voice celebrities of popular video games, or the synthetic girl bands of Japan, or even cartoon-based bands like GorillaZ, show us what will come in the very near future: a time for the totally digital, “fake", virtual, non-existent celebrities. We might not even notice the change. These days, adverts for popular shampoos are indeed almost all digitally enhanced — nobody has that “perfect hair" look anyway! So all we get is digital images of what seem to be flesh-and-blood models — but often they aren't. How can we know? William Gibson's Idoru goes a further step — giving these digital constructs a personality of their own (though clever AIs) and making them have a virtual life so that they can interact with their fans. And how does that interaction occur? Why, mostly through virtual realities, of course — which shouldn't surprise us at all! Consider the following: from all the CDs you've got at home (or MP3 on your iPod), how many times have you actually seen your favorite band perform "live" onstage? Most of us — except, of course, very serious fans —have listened to thousands of times more recordings than attended live performances, and this is natural for the 21st century. But just 150 years ago, people listened only to live performances! Now we come to the interesting point. We still place books like Idoru and movies like Simone in the science fiction folder, and download our MP3 or watch our movies of our favorite bands, and separate between both. We smile at the sci-fi concepts of "virtual personas", and think "One day, perhaps, the world could be like that — but not today". There is still this feeling that virtual realities are, well, virtual — and physical is real. We still know how to separate one from another. although one that was very laggy and marred by technical difficulties. But was this really a "live concert"? Suzanne was... behind a computer... singing into a microphone... and definitely not on a physical stage... but then again, these days, all singers on a stage are behind a microphone anyway, and if you're unlucky not to be at the front row, you'll be watching Suzanne on a huge screen anyway, and miss completely that she's the tiny dot hundreds of meters away. You see where we start to push at the barrier separating what we traditionally call a live concert and what we now call a virtually live concert? And, suddenly, we see that the barrier is flexible. It yields to our touch. Sitting in the last row at a physical concert and watching Suzanne Vega on a giant video screen, or being inside the same virtual environment with Suzanne's avatar. What gives us the better "live concert” experience? In our modern age, we rely less and less on physical presence of people, but we rely on images of these people; this is the legacy of the TV generation. Since images and videos were not easy to fake, we believed implicitly that they depicted real people and real events. We also know, of course, that movies and TV series can weave an almost perfect web of illusion — authors call it willing suspension of disbelief. This is by far not a new concept; even Shakespeare already mentions it. But in our age, due to the way we are continuously surrounded by a digital cloud of media — images, Web, TV, movies, sounds, all of them digital and not physical — our primary form of input from the "real world" beyond our immediate surroundings are, indeed, not physical but digital creations. Frogg Marlowe is one of the most famous "live" entertainers in Second Life. 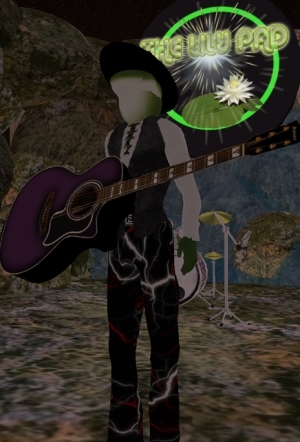 Frogg describes himself as a minor artist in his home town in the American Northwest, and was almost broke and homeless when he first started to give his concerts, and now almost certainly draws much larger audiences in Second Life than he does in real life. What exactly does this mean? He does have his own website, of course. He also sells his CDs and MP3 from there. Actually, he has even given interviews to MTV, where he talked abut being Frogg! So he most definitely is a "virtual celebrity". But is there a "real" musician behind Frogg? According to Frogg himself, not really. His success is in a virtual world, but it is real success. The issue here is that Frogg, without Second Life, would not exist. Oh, of course the real person behind Frogg would definitely exist — but he probably wouldn't become a famous musician being interviewed by MTV and able to make part of his living from his talent. Celebrities are, in a sense, tied to a specific medium, and they are recognized when they're viewed in the context of that medium. Outside of that medium, they don't catch anyone's attention — with few exceptions. For some years now, we have been used to the concept of Internet celebrities. MySpace's founder, Tom Anderson, for example, is listed as having 150 million friends on his social network. Well, we know that number is fake (Tom is automatically added to every new profile), but the question begs asking: if there wasn't an Internet, would Tom Anderson be nevertheless a celebrity? Again, just like with Frogg, the answer is no. However, the mainstream media recognize "Internet celebrities" because the Internet is "just another medium", and one that is these days almost as popular as TV (one billion users and counting.) Take the case of MySpace star Tila Tequila with her own millions of friends, a Hollywood agent, an MTV show— and a much less popular SL avatar. There are still strong ties between the real person and its virtual personality inside the medium. Conceptually, we can still make the leap from Tom and Tequila the Real People to Tom and Tequila the MySpace accounts — the medium creates the celebrity, but the person is still physically tied to the celebrity's virtual persona. Second Life, however, goes a step further. Here we can separate the link between our physical selves and our virtual personae. The celebrity status in Second Life — as the Frogg example demonstrates so clearly — is totally disconnected to the physical self. In many cases, the "celebrity status" of an avatar's pseudonym, as measured by Google hits, is far beyond the status of the real life name. This raises an interesting question — can someone who is a "Second Life celebrity" become a celebrity in real life? Second Life celebrities are a rather special kind. First and foremost, they have not only an image — an avatar — but a whole virtual life of their own inside a synthetic environment. They keep in touch with friends and acquaintances on special, social circles — which don't have a physical counterpart. They are associated with specific locations — places where they can usually be found (e.g., their virtual homes, the virtual clubs they go to, the sims where they hang around.) They are often hard to meet, just like RL celebrities — they are felt as special, unique persons inside this strange world of Second Life, and often they have their own legion of fans, and, in a few cases, a personality cult evolves around them. Well, none of this is really surprising, since the same happens with real life celebrities, or even with Internet ones. The strange aspect of all that is simply that the avatar doesn't really exist — in the physical sense of existing. It has no physical counterpart — although one can always imagine the avatar as being the manifestation of one's self inside a synthetic world, the truth is that this relationship is in our minds only. SL celebrities from all areas — not only live performers, but even our virtual millionaire Anshe Chung, the fashion leaders like the Midnights or Starley Thereian, community leaders like Aimee Weber, artists like Starax Stratosky, writers and thinkers like Walker Spaight, Spin Martin, Tateru Nino or Prokofy Neva, are thus more akin to Gibson's Idoru than anything else. Sure, we know that our fellow residents are not AIs, but animated by human beings. However, we often fall in love with the avatar (and, fortunately, mostly with the personality behind the avatar), and not necessarily with the physical being that lives behind the avatar. This is, indeed, not new — how many of us, in our teens, didn't fall in love with our stars and idols — band members, movie actors — and venerated their images? So we see lots of similar examples in RL where people are attracted by the glamor of an image surrounded by a medium, and this, again, is nothing new. Although it certainly feels different. There is a certain magic that entices our suspension of disbelief — for us, while we're connected, the avatars we see and the personalities we get in touch with through the interaction with those avatars, are far more "real" for us than, say, Suzanne Vega singing on a DVD. And that is indeed a bit surprising! Thus, in a decade or so, it is likely to assume that the entertainment industry will instead focus on "virtual bands" like GorillaZ — purely imagined avatars created from real musicians that throw a show on stage under their virtual personas. And these personas will be the ones that will be the celebrities — nobody will know the real names (or the real looks) of the musicians on stage. They will get interviewed by MTV and virtually attend talk shows — in virtual studios, with virtual interviewers, but watched on TV without anyone really knowing who is a physical person in flesh and blood, and who is just a digital, synthetic image, totally unrelated to their physical selves. The frontier will be much thinner then — but, unlike what the popular media and the science fiction movies tend to show, this will be more gradually introduced, and that people will get used to it without even noticing. Between now and the next tens years, the difference will be just one of increasing the suspension of disbelief. If we are able to do photo-realistic imaging in real time in 2020, we will still be able to get an autograph from Madonna’s avatar in 2020 — who may look like she did in the 1980s, and we will know that it's just an avatar of her. But she might continue her career in virtual worlds even when she’s left the physical stages, and continue to be the refreshing and stylish woman that lured her audience into frenzy in the 1980s. Will Madonna the personality chameleon adopt a new — virtual — persona and finish her career on the stages of Second Life? The interesting bit about "virtual celebrities", however, is that they will have a social life as celebrities inside a synthetic world. They will talk back to fans and attend social parties; they will not be remote and inaccessible, but they will be in view of the residents who happen to be their fans. They will be spotted in SL and pursued by fans; they will naturally give interviews to the media (SL or RL) but also answer IMs. Will they be "real" or just someone behind an avatar, as with GorillaZ today? The truth is that nobody will know. My question is: will anyone care? Gwyneth Llewelyn writes a much-cited Second Life blog, and is Business Manager for Beta Technologies, a metaverse development company with numerous real world clients. Her company bio lists her real world professional background-- but only merged to her avatar identity. Mickey Mouse is one of the most recognized celebrities in the world. Kermit the Frog has given live interviews. How many lunchboxes bear the face of Elvis, how many Elvis impersonators are earning a living today, and how much money did Elvis' image earn while he was alive compared to how much licensing has brought his estate after his death? Betty Boop is widely recognized, but how many women provided her voice, and can you name any of them? Deceased celebrities appear in films (John Coltrane in Vanilla Sky, Marlon Brando in Superman Returns). A dead author's byline continues to appear on new novels (V.C. Andrews). Were mythological figures like Hercules or Pandora based on real people, and how many people know their names today? How many people had heard of King Tutankhamen when he was alive versus the crowds that visit his treasures in museums today, and have you ever seen a King Tut Halloween mask? How many people had heard of Homer while he was alive, how many people read his works after his passing, and how many people today when they encounter his name think not of Odysseus, but instead, "Oooooh, donuts!" Gwyneth: Excellent read and spot on. Thank you for that! Kimberly: I know this is a bit off-topic, but I had to share... a dear friend of mine made a little extra money buying and selling books in his early teens. Seems he made an extra $10 US when he sold his paperback copy of Odysseus to an uninformed - and clearly not the owner - bookstore attendant. My friend had taken the liberty of inscribing an "autograph" inside that book that read... "Best wishes, Homer." I would not say it is 'impossible', given the formidable technology that Gibson imagines runs Rei Toi. She can project her physical presence into RL by way of holograms and is a Turing-level AI. A relationship based on mutual exploration of the spiritual (as is clearly what Rei Toi and Rez have) could work quite well, even if one partner trying to 'see the light' is litterally made OF light! 'Ray Kurzweil, the guru of the extropian movement'. Actually, I think Max More is the guru of the extropian movement. Kurzweil is a Singularitarian, which is not something the extropians subscribe to, because they view it as a temptation towards passivity and an expectation that a higher power will just solve our problems for us. Extropia DaSilva-wants to get her hands on that hologram tech, pronto. Max More is the father / guru of transhumanism (H+) and the author of the transhumanist philosophy of Extropy. Kruzweil is piggy-backing on More's ideas.